Unfinished capriccio showing two pavilions, one domed with a triumphal arch centrepiece, and the other in outline, linked by a three-bay quadrant with relief panels above two niches containing sculpture. A detail of a quadrant is below. 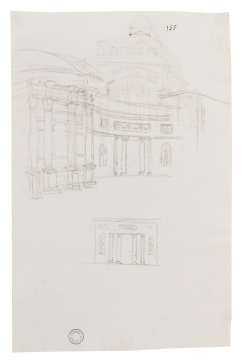 You are here: CollectionsOnline / Unfinished capriccio showing two pavilions, one domed with a triumphal arch centrepiece, and the other in outline, linked by a three-bay quadrant with relief panels above two niches containing sculpture. A detail of a quadrant is below. Academic study in pencil and pen showing a symmetrical pavilion with coffered and apsidal entrance on steps, flanked by segmental headed doors with relief panel above and cupola on top. This composition is one of a series of exercises that can be seen in Adam vol.55/168-171 and is possibly taken directly from 55/51. Also on the sheet is the elevation of the garden façade of Inveraray Castle, Scotland, above an outline plan. William Adam (1689-1748) worked on Inveraray Castle, Scotland between 1745-48 and John Adam (1721-92) did so between 1751-53 (see I. G. Lindsay & M. Cosh, Inveraray and the Dukes of Argyll, Edinburgh, 1973, pp.52-65). The garden or south front was engraved for Vitruvius Scoticus during the second period and the drawing here is probably a copy after that print. This chalk scheme is developed further in the red chalk drawing in Adam vol.55/165, attributed to Laurent-Benoít Dewez (1731-1812).